A high school All-State and All-American from basketball-crazy Indiana, Don Curnutt arrived in Miami in 1967 expecting to live up to those expectations: the Tipton native did not disappoint ! Playing in the days before 3-point field goals, and when freshmen could not play, Curnutt averaged 22.7 points a game in his sophomore campaign and shot an impressive 48% from the field, while scoring 635 points. The latter was good enough to erase the immortal Rick Barry's sophomore scoring mark. This would not be the last of Barry's records that Curnutt would make a run at. 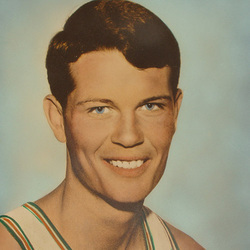 In 1968, the Hurricanes found themselves playing a shortened schedule, yet by season's end Curnutt was just 235 points shy of 2nd place on UM's all-time scoring list. He averaged 27.6 points per game. Entering his senior year, Curnutt was poised to become only the second Hurricane player ever to score more than 2,000 points in a career. Fueled by five games where he notched 40 or more points, Curnutt accomplished the feat, finishing his career with 2,006 points, and in the process fell just three field goals short of Barry's career mark of 816 field goals made. After averaging 28.4 points per game, he was named a second team All-American in 1970. The greatest shooting guard in Miami history, Curnutt is tied with Barry as the all-time Hurricane leader with 61 twenty-or-more point games, and is still among the top ten in seven other career categories, including 3rd in career points and holds the career mark for most career field goals attempted. He also places in 6 season categories. Curnutt was honored by the University of Miami in 2010 by having his jersey placed in the rafters at Bank United Center.